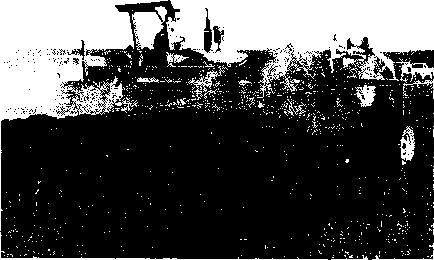 At the international level, attachments for two- and four-wheel tractors are not difficult to locate. Each manufacturer generally offers a full line of implements to fit hts machinery, including even the unfamiliar power take-off tools for wind rowing, harvesting, and pumping as explained in earh chapter of this book. In North America, the latter are not always so easy to come by, but three companies do carry the basic tools required for plowing, cultivating, and seeding with small tractors. These include the Brinly-Hardy Co., Inc., P.O. Box 1116, Louisville, KY 40201; the Independent \% Co. (IMCO). P.O. Box 300, Neodesha, KS 66757; and the Special Products Co. (SpeeCo), 15000 West 44th Ave., Golden, CO 80401. Many big-name manufacturers, who build tractors, carry a line of attachments from these smaller companies. Europeans have all the toots they need for the small farm and they all attach to one power unit For many implements, we have found no North American counterpart, but if available at all, chances are such counterparts will have their own motors. Certainly there are advantages to having one machine running while tending another, but consolidation provides the resources to afford a huskier power unit or other attachments. Foreign manufacturers have shown considerable interest in marketing in North America, and from our vantage point, the prognosis for getting these tools into the hands of America's small farmers looks very good.